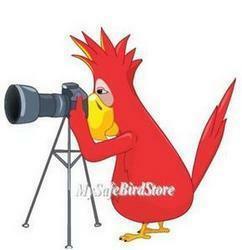 Fun videos of our loyal customers and their birds with the My Safe Bird Store products! Send us your videos! We'd love to share them! Simply adorable. Great for toddlers thru adults! Wear them on your arm, put them on your computer, your handbag, your ankle... or anywhere you'd love to take your little fuzzy friend with you! Watch the video and you'll fall in love! When you're tired of wearing him, extend his wings and set him on your desk or pillow. Adorable! Get your lawn in shape with a biker lawn-spinner, a unique way to make people smile. Made of Suntex nylon with fiberglass frame. Measures 23 inches by 17 inches and 7 inches in diameter. Video courtesy of Bob in Maryland. Thanks, Bob! Every fashion diva should have matching shoes! Ella is an adorable Goffin cockatoo who was rescued by her mom, Elsie, from New Jersey. She's quite the diva now and has a new spring wardrobe, including her new fashion sneakers! Mom loves keeping Ella busy. A busy beak leaves the feathers stay put! Isn't she just precious? Ella is also featured on FACEBOOK! Below is a short video of Ella and her new pink sneaker! Digging their new Java Tree! Pics and a video!! Ruby and Mango are sun conure sisters! They share their home with their dad, Joe, in Ohio. Ruby and Mango really love their new Tabletop Java Stand. Dad is now thinking of a full sized tree! These two beauties are also featured on FACEBOOK! Ginger trying her Bountiful Harvest! Video! Ginger shares her home with Dayna, Steve and Laurie in Alaska. She's trying her Bountiful Harvest for the first time! Looks like it's a winner! The video tells it all! Watch!! Kei is a Dusky Pionus who shares his home with mom, Allison, and his brother, Toady, in Minnesota. Kei is seen in this video with his new Creative Foraging Reinforcement Foraging Wheel. I love the video - thanks, Allison! Kei is also featured on FACEBOOK!